Makes me wish the single crossover by Norm McGrew Place had been changed to a double-crossover instead. Wasn't there an "optimized juntion" option for the Green Line that was declined due to cost? Would that have helped this situation? I'm sure there's a slide out there on it somewhere because I distinctly remember it in a presentation many years ago. I think woofner dug up some different layouts from the CCLRT EIS and other documents a while back. But I don't think the interlockings are worth mucking with right now -- the traffic signal timing is the much meatier problem. Yesterday was a first for me: I rode from MOA to West Bank Station with a Blue to Green Line transfer at Downtown East. Waiting to get in to DTE on the Blue Line did feel like an eternity. Usually I bike to work and go north/south through 4th and Chicago. The light timings at that intersection used to be very short but now are much longer, presumably due to stadium construction. I'm just wondering how much of the delay is caused by the signal timing change. Have the train movements been this bad since the Green Line opened? If your final destination is West Bank station and you're starting somewhere south on the Blue Line, you're much better off getting off the train at Cedar-Riverside and walking the final quarter mile. It will save you several minutes and lots of frustration. I guess to address this long-term on my fantasy transit map I had the Broadway streetcar being extended all the way down Washington and then cedar ave to the Franklin LRT station. talindsay wrote: If your final destination is West Bank station and you're starting somewhere south on the Blue Line, you're much better off getting off the train at Cedar-Riverside and walking the final quarter mile. It will save you several minutes and lots of frustration. I'm aware of that. What I was wondering is whether it was this bad before signaling changes. It depends on exactly what spot you're talking about. There are now a few more places where trains can get stopped on their way into and out of downtown that never existed before, mostly at new signals by new switch points. I do remember being on trains that got stopped at the light at 4th & Chicago pretty frequently before the Green Line existed, but the rate seems to have gone up from ~50% then to ~80% now. It is notable that there's now a new onramp from 4rd Ave to I-35W from the trench leading to the Washington Avenue Bridge, so I'm a little suspicious that signal timing was changed in anticipation of additional traffic on 4th -- but that ramp was built in the months after the Green Line opening, so they probably wouldn't have set up the timing that way beforehand. Silophant wrote: Does anyone know what the 'proper train spacing' is? Like, if you're on a westbound/northbound train, and you come to a stop at the junction, are you just waiting for the train in front to clear Downtown East station, or for it to get all the way to Government Plaza station? The proper train spacing is if you walk up to the station pay and your train arrives. OR, if you transfer and cross platforms and your train arrives. Thats proper spacing! Not sure how this honestly answers Silophant's question. Proper train spacing for one person (as you've described) is a flawed idea. The goal should be frequent enough headway and spacing that trains don't have to sit and wait extended periods of time waiting on traffic signals downtown. So I'm currently studying abroad in London, and I was working on an assignment for my Advertising and Marketing class. 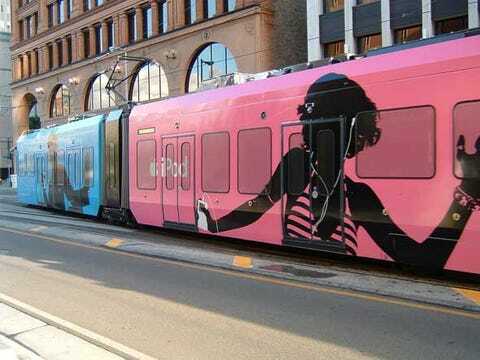 I searched for "iPod Silhouette campaign" on Google and found this image, and my first thought was "that looks like the Blue Line in DT Minneapolis...so I dug into the site to find the picture's source. Turns out it's Mulad's pic that BusinessInsider took from Flickr. Small world. I think that was in the first wave of wrap ads on the Hiawatha Line trains, and was probably the biggest single campaign in that first wave. I was always surprised that I didn't find many similar photos from other people at that time. That was from my first digital point-and-shoot -- I think the ad campaign had pretty much disappeared by the time I got a DSLR. Additionally, a policy prohibiting park & rides within Minneapolis city limits will now be in place too. There's a train broken down on the tracks Northbound, so all the trains Northbound are being held at stations. Our driver said they just got it moving again, so hopefully the line will start running again. Really frustrating that MetroTransit doesn't post this kind of stuff on Twitter, service delays like this are one of the major reasons I follow them. There's really nowhere good to put it either. I guess it could go in the Target parking lot, there's a ton of space there. But it goes against Minneapolis' desires for no more park & rides (though the original P&R was a reaction to all the hide & riders here) and also it's a bear of a walk from the Target lot to the platform. Got a link to the plan? I'd be curious to see what it says. No information than that it will cost $4 million, the FTA is paying $3.2 million, and the other $800k is coming from other. Yesterday (Sunday) I drove under the Lake St. station flyover and there was a northbound train stopped on the flyover. As I continued driving I noticed 2-3 trains stacked up between 26th and the flyover, including a single LRV on the southbound side. I feared some kind of accident but didn't see anything at 26th. Is there some maneuvering/shuttling around the OMF on weekends/off hours or was something special going on? They were doing maintenance and the line was closed north of Lake Street Station. Anyone else notice blue line trains are moving faster over 35W after last weekend's shut down? The wife and I rode downtown yesterday evening. she asked me if it was moving faster as I was thinking it seemed quicker.